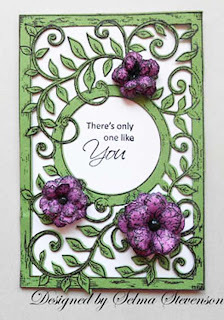 I thought this card that Selma created was so pretty and very different. I love the swirls, don't you! You can read all about it by clicking here! Be sure to check out her great tutorial for making the peony. Also, she is 3 hours later than I am, so if her card hasn't posted yet, please check back. This week, you can enter 2 cards. You will have until next Thursday, June 6 morning 6:00 AM EST to link your project. A winner will be chosen from a random drawing for week #21 The winner of the challenge will be announced Friday, June 7. This week's winner will receive a Leaf die. The winner will also be entered in the 2013 end of the year $100 gift certificate drawing. 3. Or if you are posting to the SCS gallery, you will need to use a special code to tag your card to the challenge. This week's code is joansgardens, JG0530 and needs to be posted with the challenge. Please enter both on the same line with a comma between as I have shown. Wonderful card Selma, and great challenge Joan!! Hopefully I will get a card done!! Just to let the others know, nothing personal, I do try to comment on all cards when I participate, my health permitting. For future reference, if you have the security thing set up where you have to type in the words to be able to leave a comment, I won't be commenting, I get them so screwed up, and just get stressed, so for those have that feature turned on, I won't be able to leave a comment , so very sorry!! Just had to do a second card. So many beautiful entries and Love Selma's Card!